They’re the stuff of nightmares for many of us, but when it’s time for a war against wasps, here’s how to keep the upper hand. Q: I’ve found not one but multiple wasps hanging out inside my house over the past few days, but no nest. Where could they be coming from? And—more importantly—how do I get rid of them? A: As far as desirable neighbors go, let’s face it: Wasps are pretty far down on the list. Luckily, once you’ve figured out where they’ve made their home on your property, getting them to buzz off is rarely a difficult procedure. More often than not, your biggest challenge will be to conquer your fears of getting stung. Follow these careful guidelines , and you should remain unscathed. First, make sure you’ve checked around every point of entry to your home. 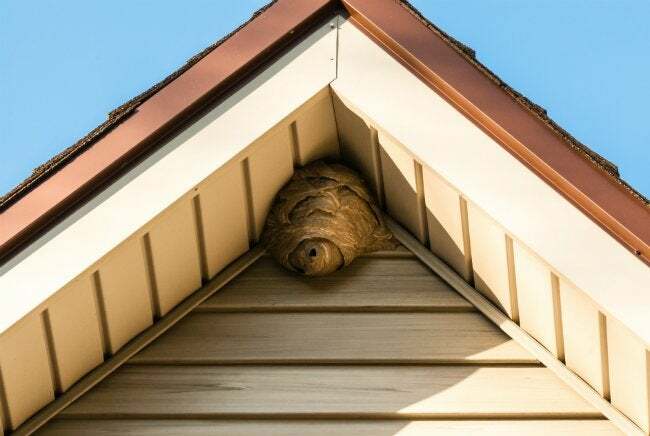 Inspect under any eaves, along the mortar between bricks, around all beams and supports in your garage, porch, and attic—wasps in your house tend to build their nests any place overhead with exterior access. Still no luck? Try your trees. These insects often make themselves comfortable up in tree limbs, primarily because wood is their home-building material of choice. Once you’ve found it, make sure it’s actually a wasps’ nest and not a wild beehive. If it’s a honeybee hive with telltale hexagons, it’s important to leave it alone; these pollinators are an important yet critically endangered part of the food chain. A wasps’ nest will be constructed from shavings of dead wood, often making it grey or light brown in color and with some swirls in its texture. When you identify the nest, proceed with caution. Know when to call in a professional. 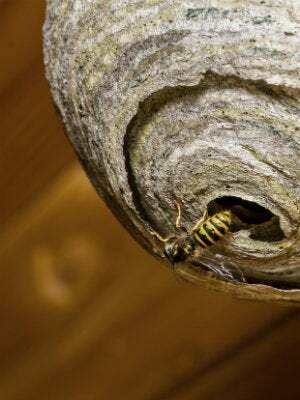 Never, ever attempt to remove a wasps’ nest yourself if you are allergic to wasp stings or your nest is out of reach. If you have a serious allergy, getting rid of wasps on your own could put you in a life-threatening position. Check with your doctor to make sure you’re in the clear before moving forward. Equally high-risk are wasp nests that require a ladder for removal. A swarm of wasps could easily cause you to fall from as high up as the second story, promising injuries and medical bills that cost much more than what an exterminator would charge. In either case, your only option is to call in a professional to remove the wasps’ nest on your property. Should you opt for DIY extermination, your level of involvement in destroying the nest will depend largely on the time of year. Wasps tend to build their homes in the spring, inhabit them throughout the summer months, and die off once the temperature dips. So, if you’re just noticing a problem at the end of summer and can handle a few more weeks of pesky backyard guests, nature will do the job for you soon enough. Earlier in the season, though, you’ll want to exterminate using a wasp-specific pesticide. Choose an insecticidal aerosol spray or dust designed specifically to kill wasps, including the colony’s queen. You can purchase one at any hardware store. Administer it only at night, when wasps are less aggressive and slower to react. Dress in protective clothing (ideally covering as much skin as possible with long pants, long sleeves, socks, and footwear to prevent any stings) and be sure to follow the insecticide’s instructions to the letter. The aerosol spray can likely be applied from afar, while the dust will probably require you to get up close and sprinkle it around the nest’s opening. Whichever method you choose, have an escape plan ready in case you get swarmed. Once you’ve done the deed, return to the nest in the morning and knock it loose using a long stick or broom handle. No matter how high the hive is, stay off of the ladder—you won’t want a still-live wasp buzzing out and around you while you’re stuck at the top of an unstable stepladder. Keep your distance at first, stay aware, and know your escape route so that you can reach safety quickly. Cautiously dislodge the wasps’ nest from where it hangs. When it drops to the ground, break it into pieces using the same stick, and reapply your pesticide of choice on the inside of the pieces. Then dispose of the nest and any dead wasps immediately. Whether it’s a DIY operation or you need to call for backup, good luck and be safe out there! 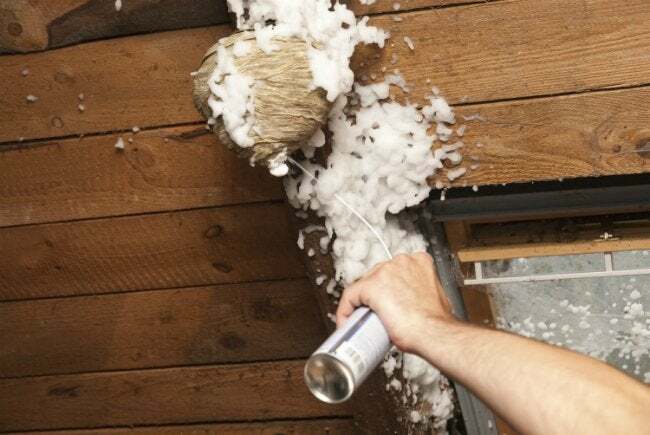 After you’ve taken care of the source of the wasps in your house, wrap up by proactively closing up any potential entry points to the inside of your house—cracks around doors and windows, loose exterior siding—so you won’t have a repeat of the situation next season.